The ration card is not only a testimony to scarcity. The Revolution has converted it… into a testimony to equality in difficulties. —Adolfo Gilly (1964, p. 69). Resolving the food crisis is essential for the very survival of the revolution. —Laura J. Enríquez (1994, p. 4). Since food rationing was officially established in Cuba by Law No. 1015 of March 12, 1962,3 the issues of food scarcity, food security, and food crisis have commanded the attention of both supporters and detractors of the Cuban regime.4 Supporters have gone so far as identifying the U.S. economic sanctions against Cuba as the main culprit behind the situation. The food problem has impacted detractors of the regime so much that many have left the island simply because no hay comida (there is no food). The rationing and availability of food in Cuba have fluctuated during the last 40 years. The “special period in time of peace,” established in September 1990, has brought about new creativity in terms of food availability and distribution. This paper intends to describe the different food distribution outlets in Cuba today.5 Before doing that, the next two sections provide summary background on the history of food rationing since the early years of the revolution. Practically all food items were included in the first rationing scheme. Each household was entitled to purchase, at subsidized prices, a specific quantity of the rationed items, depending on the number of consumers listed on the ration booklet issued to each household. Needless to say, the quotas have not remained static over time. As production of some fruits and/or vegetables increased, these items were taken out of the rationing system and sold freely (por la libre); when they became scarce again, they were returned to the ration booklet. Eggs are perhaps the best example of items that have fluctuated in and out of the libreta. Interpreting the information from the evolving quotas under the rationing system through time as food availability increases or decreases is extremely difficult and misleading for several reasons: (a) many Cubans have had access to subsidized lunches in their workplaces; (b) children living in boarding schools still received their household quotas, and those attending regular schools were provided lunch there; (c) eating away from home is an alternative for a small segment of the population; (d) many of the items listed in the first ration booklet were the result of excessive optimism on the part of the planners but were never available;8 and (e) buying food in the black market has been an alternative during most of the rationing period. The establishment of the special period in time of peace in September 1990, together with the legalization of the holding of foreign currency and remittances from abroad in 1993, and the creation of the free agricultural markets in 1994, have added new dimensions to the food rationing scenario. Decreasing food production has resulted in fewer products available through the ration booklet at government stores. Food available at the agricultural markets became a new alternative, but prices have remained high when compared with the purchasing power of most Cubans. The former conditions resulted in the establishment of several other outlets for the sale of agricultural and meat products, which will be discussed later in this paper. Before doing that, let us review very briefly the polemic between supporters and detractors of the Cuban regime on who is to blame for the rationing system. The first paragraph of this paper states that many supporters of the Cuban regime blame the U.S. economic sanctions against Cuba as the main culprit, while almost all the detractors place the blame on the inefficiencies of the socialist system. Given the importance of this issue, in terms of the hardships it has represented to the population on the island, the two points of view deserve careful analysis. The cost of administering the food rationing system is set at seven million Cuban pesos. Since the sentence is written in the present tense (“increase in annual budget expenditures…”) it is confusing. Are these at current or constant pesos? Since the book from which the quote was taken from was published in 1991, it would be safe to assume that the figure pertains to a previous year and must have grown thereafter. At any rate, the figure represents a high monetary price the Cubans have to pay to support a rationing system that has been in effect for 40 years. In many of my publications I have stated very clearly the unequivocal damage that the U.S. economic sanctions have had on the Cuban economy. I have not stated, however, that they are the main reason for the current state of affairs. In this case one has to distinguish between the Cuban economy in general and “a rationing system for basic food and industrial products” as quoted above. To blame the U.S. economic sanctions for the existence of a rationing system of basic food products is not a very intelligent argument to justify Cuba’s socialist system. It is an admission that Cubans cannot even produce what grows very easily on Cuban soil. If one lists the food products that have been rationed since 1962, it becomes evident that almost all of them were in abundance before the 1959 revolution. Granted, all Cubans were not able to consume a wide variety of products because the instrument for rationing was the price system. But even after the rationing system was established, there have been periods in which the abundance of several products demonstrated the feasibility of returning to a stable and ample supply of food products. I remember the proliferation of a chain of government stores called FrutiCuba devoted exclusively to the selling of numerous fruits and vegetables in the mid-1960s. 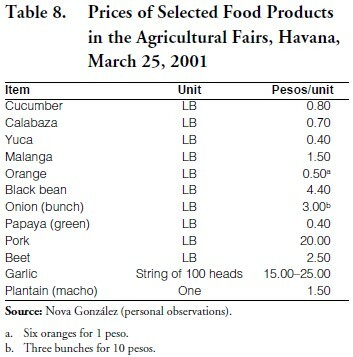 The existence of the free farmers’ markets in the 1980s, the free agricultural markets after 1994, and the new food outlets described below testify to the ability of Cuban farmers, now including urban inexperienced farmers, to produce abundant food supplies despite the U.S. economic sanctions, that could do away with the food rationing system. It is interesting to recall that, when the Soviet bloc was subsidizing the Cuban economy to the tune of five billion dollars per year, food was still rationed in Cuba. In its broadest definition, a bodega is an outlet for the selling of food products, or a food store. It can be a modern one, such as a supermarket, or a small onedoor place. A placita is usually a small outlet for the distribution of fruits and vegetables, which is also known in Cuba as puesto. These are the two main outlets selling products in the ration booklet. These outlets have been in existence since pre-revolutionary times but were expropriated and later became the only outlets involved in the selling of rationed food. Others have been added in some neighborhoods while some have been closed with the passage of time. According to Nova González (2000a, p. 146), it has been estimated that the rationing system supplies around 61% of calories, 65% of vegetable proteins, 36% of animal proteins, and 38% of fats of the daily intake of the Cuban population.11 I want to point out that consumption of rationed goods is greater in Ciudad de la Habana province than in other parts of the country. The special period brought about sharp reductions in the availability of food products in the rationed market. The quota allocation in July 1998 evidences this fact (Table 1). Almost eight years after the establishment of the special period, quota amounts had yet to equal those in the1980s. Dramatic examples of meager quotas include one pound of chicken per month, six ounces of coffee (mixed with soybean or other product) per month, six pounds of rice per month, and many others. Another problem is that, according to Díaz Vázquez, the products and quotas listed in Table 1 are not supplied at the time they are due12 and in the quantities specified. Meat derivatives, distributed by novena (every nine days to save one quota per month), encompass: (a) fricandel (similar to sausages); (b) ground beef extendido or texturizado (an item with one-half pound of meat and one-fourth pound soybean product); (c) mortadella (from ground chicken and other ingredients); and (d) masa cárnica (preparation for meat balls, croquettes, etc.). The population refers to these meat products with the acronym OCNI (Objeto Comestible No Indentificado), or non-identified edible object (2000, p. 51). It is hard to calculate monthly food expenses of rationed goods because all items are not always delivered on time and also because, in some instances, they are alternated every other month. Despite those difficulties, I computed the monthly expenses for a household of four adults (no children, no one over 65, no special diets), under the assumption of the availability of all listed items during the month. The total monthly expenses amount to between 140.35 and 162.79 Cuban pesos. The average monthly wage in 1998 was 217 pesos (U.S.-Cuba Trade and Economic Council, September 11-17, 2000, p. 7). Therefore, food expenses in the rationed market for a family of four, under the assumptions made, amounted to between 65% and 75% of the monthly wage if only one person was working, and between 16% and 19% of combined monthly wages if all four members of the household were employed. In per capita terms, the figures translate into between 35.09 and 40.70 pesos per month. Despite the fact that these products are sold at subsidized prices (also at the same price throughout the country), their supply always falls short. Since, according to the majority of Cubans, the rationed items are not enough to feed a person for the entire month,13 Cubans who can afford it are forced to fulfill their needs for the remaining of the month through purchases in the other outlets described below. The MLA is a new version of the Free Peasant Markets (Mercados Libres Campesinos) that were in existence from 1980 until 1986, when they were closed. The MLAs were established by Council of Ministers’ Decree No. 191 of September 19, 1994, one year after the process of agricultural reforms was started. Despite an ideological dispute among the Cuban leadership, the scarcity of food was so acute at that time that the green light was given to establish these markets. Functioning under the Ministry of Internal Trade (Ministerio de Comercio Interior, MINCIN), there are 332 throughout Cuba, 64 of them in Havana. Parties authorized to sell agricultural and meat products at the MLAs include the state enterprises, the basic units of cooperative production (UBPC), work youth army (EJT), agricultural production cooperatives (CPA), cooperatives of credit and services (CCS), private farmers, and budgeted enterprises with self-consumption areas. The authorization is only given after the unit has fulfilled its commitment with the state. Products not allowed in the MLAs include potatoes, coffee, cocoa, beef, and eggs. In addition, some restrictions exist for certain enterprises. For example, sugarcane UBPCs are not allowed to bring the surplus from their self-consumption plots to the markets. Livestock UBPCs can not sell any meat products, milk and derivatives. Rice and citrus UBPCs can not sell their main products either. MLAs were conceived to function in a competitive manner where the laws of supply and demand would determine prices. However, as the result of a variety of endogenous and exogenous factors, these markets functioned as oligopolies (dominated by the sole presence of state and private units) until 1998. In 1999, the state decided to withdraw from these markets to establish the agricultural markets with maximum prices (see below) to compete with the MLAs. This event left the private units as the only participants in the MLAs, which became a real monopoly.14 Suppliers were then able to fix prices amongst themselves and thus non-declared cartels for different commodities became into existence (Nova González, 2000b, p. 1). These stores had been in operation before the process of reform started in July 1993, when the right to hold and use foreign exchange (i.e., U.S. dollars) was granted to the population. They were formerly known as “diplomat stores” because the majority of their customers were diplomats stationed in Cuba. Once the Cubans were able to shop in them, they were given the flamboyant name of Stores for Recovering Foreign Exchange (TRD). In the popular argot they are known as “dollar stores” or la chopin (from the English gerund “shopping”). Products are sold in these stores at very high prices in relation with the informal exchange rate between the peso and the U.S. dollar. In some cases, these prices do not reflect the quality of the products sold compared with the MLAs. It has been estimated that TRD prices represent a tax to the consumer of more than 200% over the cost of the goods imported or produced in the country. They are far higher than the prices of similar products sold in the MLAs. The TRD’s pricing policy results in higher prices in the MLAs, since they represent a reference price to the suppliers of the latter markets (Nova González, 2000b, p. 2). These markets were established in 1999, separate from the outlets operated by the MLAs. Functioning under the Ministry of Agriculture (MINAGRI), there are 2,455 of these so-called agromercados. The majority of them are located outside the city of Havana. These markets are operated by MINAGRI’s selling enterprises, who agree on a fixed maximum price with suppliers who want to do business in these outlets. The agricultural producer pays the taxes and the state enterprise sells the products in the free retail market. A large percentage of the products purchased by these enterprises come from state units, Basic Units of Cooperative Production (UBPCs), Agricultural Production Cooperatives (CPA) and other producers. In general, prices are determined by deducting a percentage from the prices charged in the MLAs and thus the products are sold at maximum prices, slightly lower than those in the MLAs. The percentage deducted is small to avoid the purchase of products with the intention of reselling them at higher prices. In certain occasions, prices are equal to, or slightly higher than, prices in the MLAs since the decision making concerning lowering the prices is not made with sufficient speed to parallel price movements in the MLAs. This type of outlet presents problems of quality, variety and consistency in the availability of goods. For those reasons, it is not able to generate the necessary competition to be able to reduce prices at the MLAs (Nova González, 2000b, p. 2). The urban gardening movement in Cuba was born out of absolute need and it was spontaneously headed by groups of people with little knowledge about agriculture. Many of the new gardeners were cultivating for the first time. Those growers who did have some previous agricultural experience had mostly worked in large-scale rural agriculture, based on monocultures with chemical fertilizers. Very few of Cuba’s gardeners were familiar with the small scale, highly diverse, intensive techniques that are now widely used. The organopónicos and intensive gardens are the primary methods of urban cultivation.15 The only difference between the two is the structure of the garden: whether cultivation occurs in raised beds or in the pre-existing soil. The organopónicos are the most popular of the two because of the poor quality of most soils in urban areas (Altieri et al., 1999, p. 132). Both gardens and organopónicos fall under the Ministry of Agriculture.16 Fruits and vegetables grown by them or brought from other places are sold daily. Prices are usually between 10% to15% lower than those at the MLAs; in some instances, however, prices may be equal or higher than in the MLAs (Nova González, 2000b, pp. 2-3). These selling stands and placitas have been established in a very discrete manner. They are mainly intended for the selling of products from CPAs and from the EJT directly to the population. In general, prices are lower than in the MLAs. However, since there are not enough of these places, they cannot exert any downward influence on prices at MLAs. These outlets are government stores established for the sale of processed food products. Some examples of products they sell include vegetable oil, rice, beans, cheese, juices, and others. As opposed to the TRDs, products can be purchased in national currency at prices slightly lower than or similar to those in the TRDs at the prevailing informal exchange rate of pesos/ dollar. These markets are organized by the Ministry of Agriculture on the last Sunday of each month in Ciudad de la Habana. Prices are significantly lower than in the rest of the food outlets, benefiting both consumers and resellers. Since they are held only once a month, their low prices cannot exert a direct impact on the general price level of the other outlets. For that to happen, larger volumes sold on a daily basis would be necessary (Nova González, 2000b, p. 2). This market has experienced ups and downs during almost all the time the revolution has been in power. The reason for its unstable behavior is mainly the variation in food availability at official outlets. In the last few years, prices have also been a determinant, since black-market sellers can offer their products at prices slightly lower than those prevailing in the official outlets. One important characteristic of black market food sales is variety of forms and places. For example, in terms of location, black market sales can be made in homes, by hawkers on the streets, in placitas of rationed products, or at fixed selling places. Products sold include farmers’ production that bypasses official outlets, the surplus from products distributed through the ration booklet, and stolen goods from state enterprises or other sources (“everybody steals but nothing is missing”), and a few others that escape my memory. After a decline in these activities resulting from the availability of food products at the MLAs and other official outlets in the mid-1990s, a sharp increase in black market sales has been noticed since 1998. This fact could be the result of rising fees to operate in the MLAs and the stability of its high prices. Black-market sellers can offer their products at lower prices because of the savings from not paying either income taxes or the fees for the space and services provided at the MLAs. Writing in mid-1998, the U.S.-Cuba Trade and Economic Council states that, in addition to the official markets described above, Cuba has a substantial “black” market where available products range from the stolen (meat, seafood, etc.) to the homegrown (chickens and eggs) to the homemade (cheese, baked goods which are permitted but may be produced with ingredients obtained through the “black” market) to the forbidden (beef and lobster) (29 June 1998 to 5 July 1998, p. 6). This section of the paper explores a few issues related to quantities available in the different markets and areas of the country, the quality of the products sold at these outlets, and price differentials in the different markets and areas of the country. Since all the data required to conduct such analyses are not available, I will concentrate on a few, but relevant, differences in allocations and prices. The reason for these differences will be addressed in the final part of this section . The first issue discussed is the potential quantity difference across regions in allocations of rationed items. Form the outset of the rationing system, Havana has been allocated greater quantities than the rest of the country for political reasons.18 The situation has not changed during the special period and in fact the gap has grown. The comparison is made between Havana and Santiago de Cuba (Table 3), which should be the least biased choice because Santiago is the second largest city in Cuba and has received better treatment than the rest of the interior of the country as the cradle of the revolution. Although not containing all articles, and with more than one year difference (which I believe to be irrelevant), the information contained in Table 3 is very revealing when compared with the last column of Table 1. Only in four of the 19 items listed are the allocations equal in both cities (the ratio=1). With regard to only one product (toothpaste) was Santiago’s quota slightly higher than Havana’s. In some of the items, Havana’s advantage over Santiago is 4, 6, 16, or 35 times greater. Canned fish and hen were two food items appearing in Santiago’s list that were absent from Havana’s. 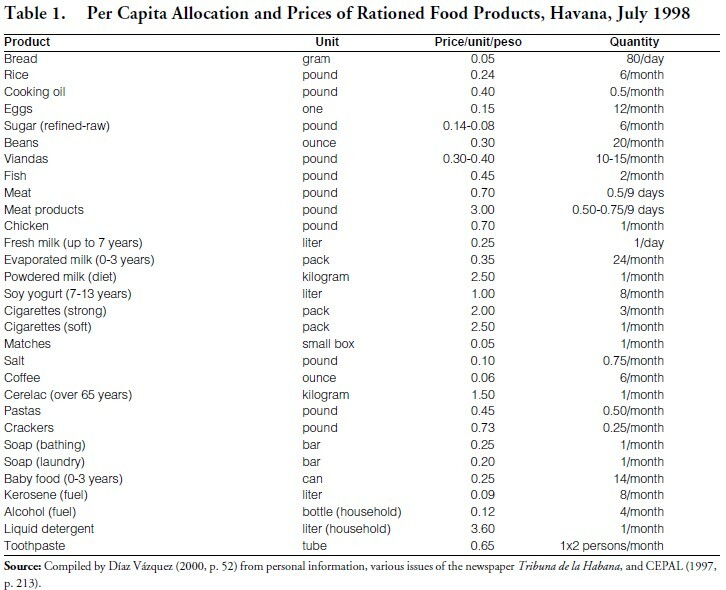 Therefore, the conclusion of this brief analysis is that there are regional differences in the allocation of rationed food products, with Havana receiving more items and in larger quantities than the rest of the country. As stated above, prices of rationed products, are the same in all regions of the country. The second issue still refers to regional differences, this time regarding prices at the MLAs. 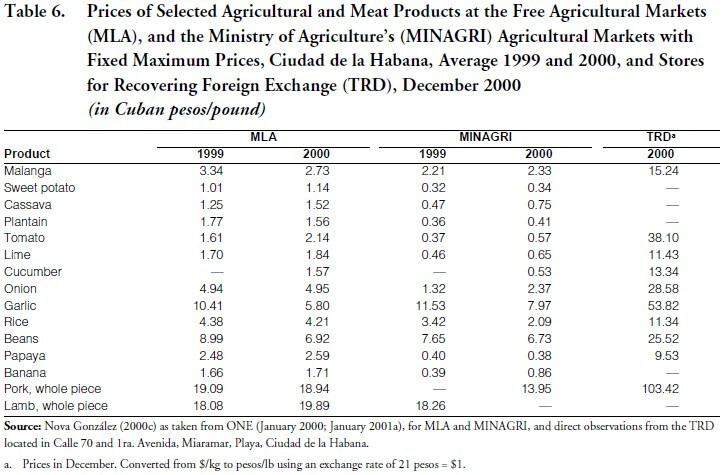 The data contained in Table 4 allow price comparisons in free agricultural markets in Havana, Camagüey (500 kilometers east of Havana), and Santiago de Cuba (850 kilometers east of Havana). Data include prices at the end of August 1999 and at the end of August 2000. Of the 30 food items listed, three (tomato, tangerine, and grapefruit) were not considered in the analysis because of lack of complete observations in both years, while lettuce and oranges were compared only for 2000 and 1999, respectively. After extracting these 24 observations, I studied the remaining 156. For each year separately, prices in the three locations were assigned a ranking (1, 2, or 3 from highest to lowest) and the same ranking when they were equal. I then added the numbers for each year and each city. Needless to say, an inverse relationship between price and the index is pre-determined, i.e., the lower the index, the higher the price, and vice-versa. The ad hoc procedure, which claims no statistical rigor, was necessary because a weighted index was out of the question since quantities purchased were not reported. For 1999, the index numbers were 30 for Havana, 52 for Santiago de Cuba, and 59 for Camagüey, reflecting prices in descending order. For 2000, the corresponding numbers were 31 for Havana, 49 for Santiago de Cuba, and 65 for Camagüey. It is interesting that the numbers were so close for the two years and both times the three cities were positioned in the same order. Therefore, the conclusion is that there are regional differences in the pricing of agricultural and meat products in the MLAs in different geographical areas of the country, with prices in Havana being higher than in the rest of the island. The latter makes economic sense since more people (about 2.4 million) live in Ciudad de la Habana province and its inhabitants enjoy higher purchasing power. Higher prices in Havana’s MLAs attract sellers from nearby towns and even provinces. By definition, prices in the Ministry of Agriculture’s (MINAGRI) agricultural markets with fixed maximum prices should be lower than those in the free agricultural markets. It was for that reason that they were established. A short list of selected products covering the national average for 1999 and 2000 was developed (Table 5). Simple observation confirms that in fact average prices at MINAGRI’s markets were lower than those in the free agricultural markets for every product listed in 1999 and 2000. Price differentials show wide variations. They range from a few cents per pound (e.g., garlic in 2000) to three and four times higher (like lime and papaya in both years). By now, the reader must have a sense of price disparities among the food outlets in Cuba. I wanted to test price disparities for Ciudad de la Habana province (Tables 6 and 7). The experiment produced almost identical results to those in the previous section between the MLAs and MINAGRI’s placitas for the whole country. It could not be different since, again, by definition, the latter were established to offer products at lower prices than the former outlets. 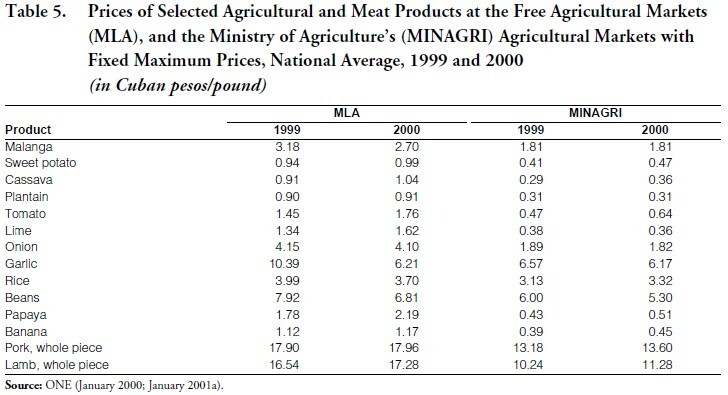 Prices of all products (except garlic in both years) were consistently higher in the MLAs than in MINAGRI’s outlets. The range varied from almost identical price for lamb in 1999 to papaya prices more than six times higher in MLAs in both 1999 and 2000. The products within the previous range show wide variations (Table 6). No surprises were found when comparing prices at the TRDs with those at the MLAs (which were the highest of those studied so far). As expected, prices at the TRDs in 2000 were well above those at MLAs. For example, while the average annual price of rice was 169% higher in 2000, that of tomato was 1680% higher the same year (Table 6). The reasons for these disparities will be explained in the last part of this section. Prices at the gardens (huertos) and organopónicos are not systematically recorded by the Cuban government. Only some examples of a few selected commodities were obtained from personal observations (Table 7). No discernible trend can be observed from this small sample. For example, the prices of malanga, tomato, and banana were slightly higher than those at the MLAs, while those of black and red beans were lower. These observations, however, pertain to a specific date when supplies were low. The same observations can be made with respect with to the agricultural fairs (Table 8). 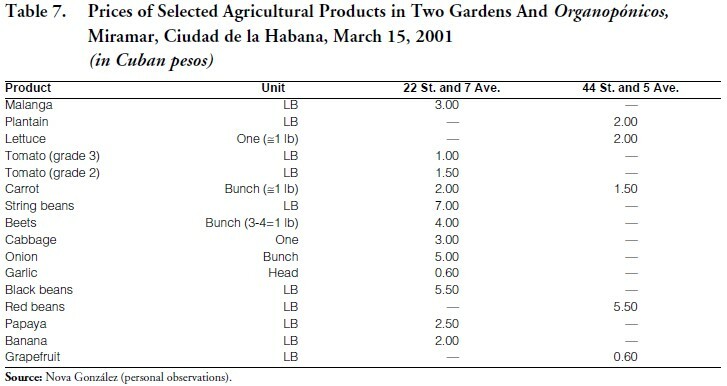 The U.S.-Cuba Trade and Economic Council has provided some data from sampling conducted during the last week of June 1998 in Havana, Camagüey and Santiago de Cuba (Table 9). 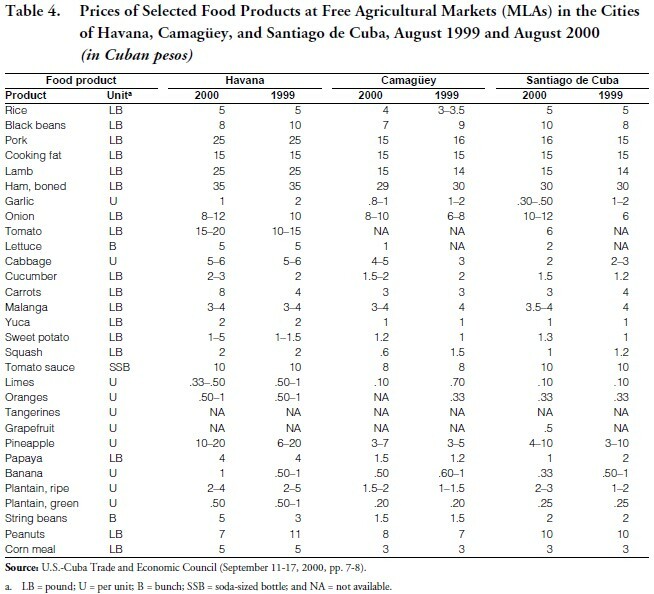 Although price observations for the three cities were obtained for only seven of the 14 products listed, it is obvious that black market prices do not behave with the same consistency as was the case with prices in the free agricultural markets in the same three cities (Table 4). For example, shrimp and lobster are cheaper in Havana than in the other two cities, while eggs are more expensive in Havana, and fillet of fish is about the same. 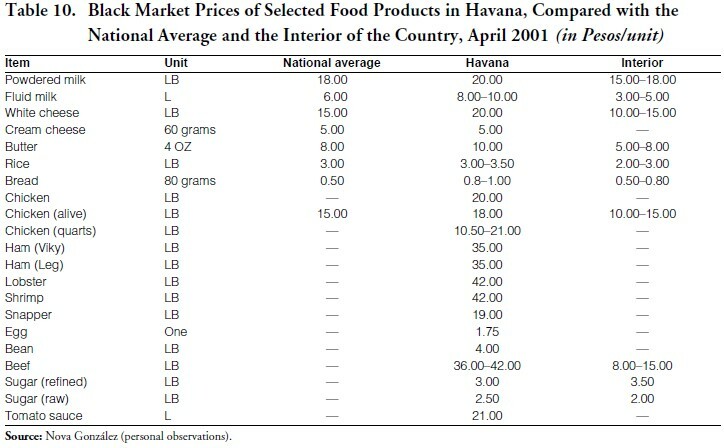 A few other comparisons between black market prices in Havana with the national average and with those in the interior of the country confirm the disparity observed in the previous set of prices (Table 10). 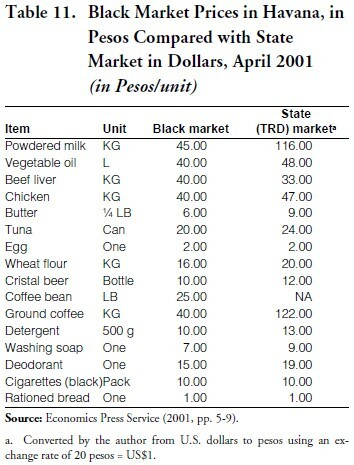 A better comparison can be made between black market prices and prices at the state market (TRD) in Havana (Table 11). It is obvious that, only for three of the 16 items (eggs, cigarettes, and rationed bread) are the prices equal in both markets. In the majority of cases, prices at state markets are higher than in the black market for the reasons explained above. The previous discussions on price differentials only make sense when the relative importance of these outlets is known. To that effect, data on relative quantities sold at two of these establishments are presented (Table 12). Unfortunately, the statistics available only differentiate between MINCIN (MLA) and MINAGRI (Placitas with fixed maximum prices) establishments. The quantities reported are for the whole country. The comparison is important since these are the two outlets where most of the products are sold. The data show interesting results. In 1999, MINAGRI’s agricultural markets with fixed maximum prices accounted for 70% of all agricultural products sold in the country, while MINCIN’s free agricultural markets sold the remaining 30%. The next year, MINAGRI’s outlets accounted for 79.5% with MINCIN’s MLAs selling the remaining 20.5%. It is a surprise that the new agricultural markets with fixed maximum prices have been able to surpass the MLAs in a short period of time, for these markets were established at the end of 1998. The situation is the opposite in terms of meat products. In 1999, 85% of total sales of meat products in the country were made at the MLAs, while MINAGRI’s outlets sold the remaining 15%. In 2000, the MLAs sold 84% and the rest (16%) was sold at the agricultural markets with fixed maximum prices operated by MINAGRI. It is obvious that, in the case of meat products, the free agricultural markets were still the dominant force in 2000. I recognize that, in the previous discussions, some statements may appear to be contradictory, while others may not make economic sense on the surface. Let me make an attempt to clarify the situation. Table 13 ranks the nine food outlets in terms of assortment, quality, quantity, and price. In terms of assortment, the free agricultural markets (MLAs) and the black market (BM) occupy the two top places because of the wide variety of products they offer, while the last two belong to the agricultural markets with fixed maximum prices (AMFMP) and the rationed market (RM). The best quality is offered at the stores for recovering foreign exchange (TRDs), followed by the BM. The outlets with the lowest quality are the AMFMPs and the RM. It is interesting, and should be a surprise to most readers, that the AMFMPs, despite their low ranking in terms of assortment and quality, rank first in quantity. In fact, Table 12 showed the big difference in quantities between the AMFMPs and the MLAs, being greater in the former than in the latter. The reason is that a large quantity of the increases in agricultural production is sent to the AMFMPs, except potatoes and bananas, some amounts of garlic and some viandas19 that are sent to the rationed market. Yet, these placitas cannot compete with the MLAs because of their lack of assortment and quality shown in the first two columns of Table 13. Below the first place of AMFMPs are the MLAs and the BM. The last two places are claimed by the agricultural fairs (only in Havana and only in the last Sunday of the month) and the RM. The last column of Table 13 ranks the outlets in terms of prices charged. The highest prices are found in the TRDs (they also rank first in terms of quality), and Table 6 shows them to be several times higher than those charged at other outlets. The lowest prices are found at the agricultural fairs and the rationed market. Perhaps the most startling finding is the price difference between TRDs and the rest of the outlets. Why would people buy at TRD stores when they can find the same products at much lower prices in other outlets? There are several explanations. 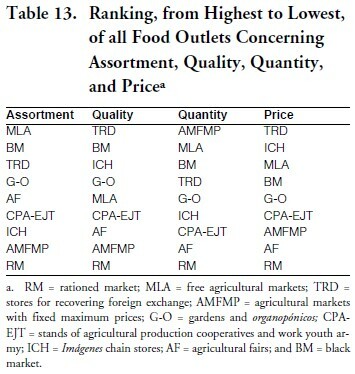 Some of them are: (a) many of the products sold at the TRDs are imported and thus command a higher price; (b) most products sold are of much higher quality, e.g., Chilean garlic not sold at the MLAs, as well as imported onions and tomatoes, clean and 100% whole rice, and others; (c) products are very well displayed, are sold year-round, and the customer gets an exact (no cheating) weight; (d) when seasonality is present, the TRDs’ main customers include those with plenty of dollars; and (e) customers purchasing special products not available at the MLAs take advantage of the trip and buy other products to avoid making another stop. 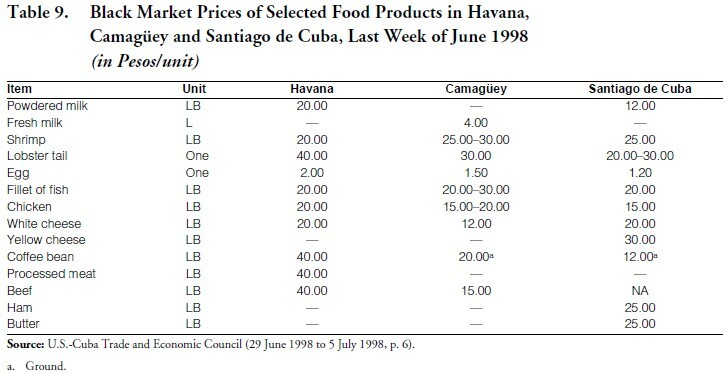 Faced with high prices in relation to their salaries, Cuban consumers continue to wonder why prices do not go down when the official statistics portray an agricultural sector with increasing production in most of the commodities discussed in relation to 1989 production levels (Figures 1 and 2). Of the seven commodities, or groups of commodities (rice, corn, beans, citrus, tropical fruits, viandas, and hortalizas21), portrayed in the figures, rice is the only one that shows a recent decline in production (21% decline from 1994 to 2000). 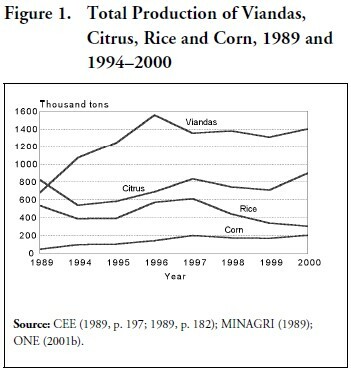 Production increases from 1989 to 2000 included 106% in viandas, 318% in beans, and 332% in corn. 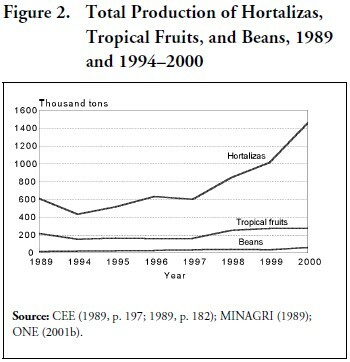 From 1994 to 2000, citrus production grew 66%, tropical fruits 80%, and hortalizas 139%. When compared with data provided earlier in this paper, it becomes obvious that these production increases are not reflected in the rationed quotas. Finally, there is some discussion in Cuba about the benefits of establishing cooperatives for the marketing of agricultural products.22 Such organizations would perform the functions of collection,23 packaging, storing, and selling. They would also minimize the tendencies for the creation of monopolies and oligopolies, and the development of cartels. In addition, these cooperatives would help in increasing production and quality (Rodríguez Castellón, 2000, pp. 52-55). Despite some gains made relative to increasing food outlets with the resulting options for the consumer, the food problem is far from being solved. The food issue has dominated the thinking and behavior of the majority of Cubans for four decades and it appears that it will do so for several years more. 1. I would like to express my gratitude to Armando Nova González, researcher at the Center for the Study of the Cuban Economy (CEEC), and Adjunct Professor of Agricultural Economics, University of Havana. During the last eight years he has shared with me his vast knowledge of Cuban agriculture through his numerous publications and long hours of discussion. He also guided me on a tour of food outlets in several Havana neighborhoods in early November 2000, which encouraged me to write this paper. The paper will be part of the chapter on food rationing and food security of my book (in preparation) Cuba’s Agricultural Sector. Armando provided more information after my return to Florida. Needless to say, the responsibility for the contents of the paper is mine. 2. This quote by Dickey appeared in The Washington Post of that date. It was taken from Benjamin et al. (1986, p. 24). 3. Food purchase restrictions had partially started in July 1961 with the compulsory rationing of a few food items, such as meat and animal fats. 4. It has also captured the attention of numerous scholars, among them, Benjamin et al. (1986), Bourne (1998), Casas (1985), Díaz Vázquez (2000), Enríquez (1994), Ferriol Muruaga (1996), Forster and Handelman (1985), García Alvarez et al. (1996; 1997), Gordon (1983), Handelman (1981-1982), Navarro (1972), Nova González (2000a; 2000b; 2000c), Scarpaci (1995), and Valdés and Bonachea (1972). 5. Beyond the scope of this paper are the issues of food security, including subsidized meals, restaurants, and paladares (small family restaurants authorized in 1993—see Scarpaci, 1995), and the answer to the question of how adequately fed is the Cuban population. Both issues are discussed in my forthcoming book mentioned in footnote 1. 6. Handelman (1981-1982, pp. 132-134) contains a more detailed explanation of the origins of Cuba’s rationing system, including its causes, evolution, consequences, and alternatives. He also discusses food consumption beyond the ration booklet (pp. 137-139). Díaz Vázquez (2000), however, is perhaps the best source of information on this subject. 7. I still remember that process very vividly. Part of the population was in shock and would walk around with the libreta in their hands looking for something to buy during the first days after the system was established. Working at MINCIN’s legal department, I was temporarily transferred to the Bureau of Complaints and Suggestions of the recently-created National Board for Food Distribution (Junta Nacional para la Distribución de los Abastecimientos). The flood of letters to the Bureau was of such magnitude that the Bureau had to be dismantled a few weeks later. 8. The long list included items such as different types of ham, cheese, pepperoni, and sausage. All cuts of beef, pork, lamb, and goat were also included, as well as different types of fish and seafood. Fruits and vegetables were listed by name, in addition to many other items that escape my memory. Such unrestricted list of food intended for distribution at the very outset of establishing a rationing system did not escape the Cubans’ sense of humor. 9. The quote was taken from Miranda Bravo (1996, p. 80). 10. Except for the agricultural fairs, which take place on the last Sunday of the month in the city of Havana, I visited at least one of all these outlets in several municipalities of the City of Havana province during the first two weeks of November 2000. 11. These figures, of course, depend on when, how, and where they are measured. 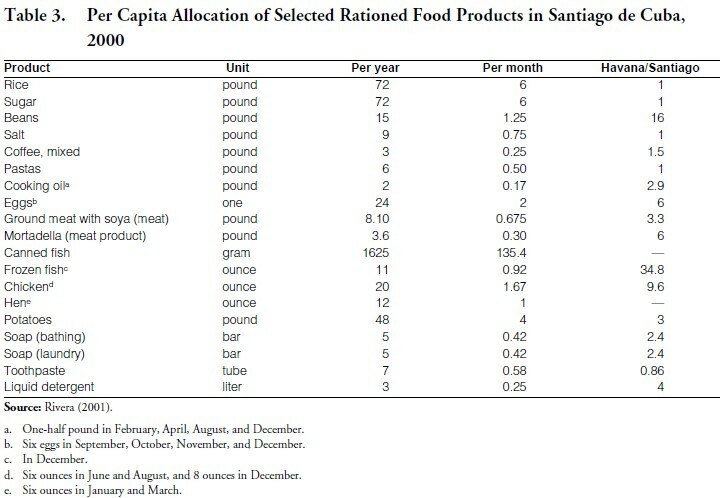 For example, in another publication, Nova González states that the rationed market contributed 49% of calories, 40% of vegetable proteins, 30% of animal proteins, and 19% of fats of the daily intake of the population in Ciudad de la Habana during 1999 (2000b, p. 1). 13. The estimate, of course, is a very subjective matter. The U.S.-Cuba Trade and Economic Council states that “all Cubans receive a limited subsidized monthly food ration (which generally provides nutrition for approximately two weeks)” (September 11-17, 2000, p. 7). I have heard that it can cover from a minimum of ten days to a maximum of fifteen days. The truth of the matter is that nobody in the presence of others, despite his/her revolutionary fervor, would dare to extend it beyond the latter figure. 14. Although the new Ministry of Agriculture outlets were established to compete with the MLAs, they could do so in terms of volume and slightly lower prices (see the last section of this paper), but the MLAs still dominated because of the higher quality and variety of their supply. These two features still attract consumers to the MLAs. 15. Although I had seen this urban agriculture in previous trips, it was not until November 2000 that I visited some of them in the Miramar area, Playa municipality. They are of an impressive beauty, very clean, well organized, and the fruits and vegetables sold are of excellent quality. 16. MINAGRI took this popular movement so seriously that, by 1994, had established an Urban Agriculture Department and, by June 1997, had 70 extension agents working in 13 of the 15 municipalities in Ciudad de la Habana (Altieri et al., 1999, p. 134). 17. To my knowledge, Pérez-López (1995) contains the only thorough treatment of Cuba’s underground economy, including agricultural- related activities until the mid-1990s. 18. For example, for many years, when real beef was distributed, each person living in the capital received ¾ pound/week; those living in cities outside Havana received ½ pound/week, and those living in rural areas were allowed to purchase only ¼ pound /week. 19. The term viandas refers mainly to malanga (taro), boniato (sweet potato), yuca (cassava), calabaza (pumpkin), and ñame (yam); it sometimes includes plantain and potato. 20. Despite the competition introduced by the new food outlets, prices still remain too high in relation to the purchasing power of the majority of the population. This issue is beyond the scope of this paper and is discussed in detail in my book in preparation mentioned in footnote 1. 21. The term hortalizas refers to a variety of vegetables such as tomato, carrot, onion, pepper, lettuce, and others. 22. To what extent this recommendation will be implemented is anybody’s guess. Torres and Pérez (1994, p. 42) mentioned this proposal for the first time right after the creation of the free agricultural markets with no positive results. 23. Food scarcity is sometimes the result of collection problems. Discussing the inefficient state collection system (Acopio) is beyond the scope of this paper. For some information on this subject, consult Alvarez and Messina (1996, pp. 189-190).